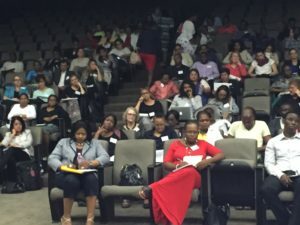 This week 150 social workers from throughout Africa came together to plan the regional report on the social challenges facing Africa and social work perspectives on the solutions. The report will be published next June along with reports from Asia-Pacific, Latin America and Caribbean, Europe and North America as the 2nd Global Report on Social Work and Social Development. The African delegates committed that the report would highlight the role of the social worker in expanding and implementing the Sustainable Development Goals. Participants stated that a social work voice was needed that emphasised ‘development’, ‘capacity building’ and ‘social justice’ rather than an ‘aid mentality’ that has not lead to empowering sustainable outcomes. Participants also stated that the current Global Agenda theme: Promoting the Dignity and Worth of Peoples was a powerful message as a person dignity must be upheld in all social services in order for them to be successful. A website will be available in the next days where social workers from throughout the region can submit there practice examples, stories and provide information on social work perspectives to the current crises. The workshop was a part of the 2015 Social Work and Social Development Conference held in South Africa, jointly hosted by IFSW, ASSWA and ASAEWI. Link to the first Global Report on Social Work and Social Development.